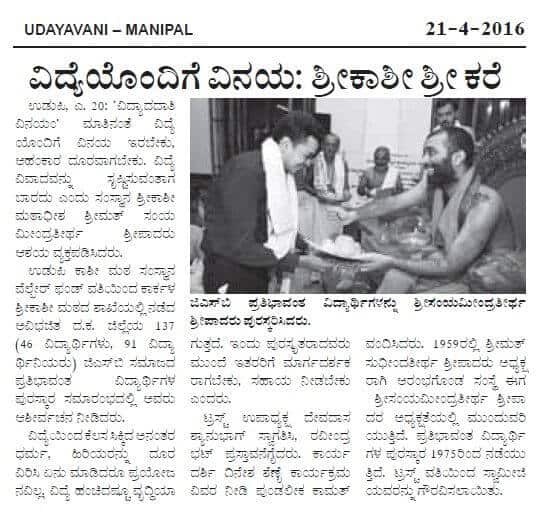 H.H Shri Swamiji, awarded scholarships to talented students at Karkala on April 20, 2016. Scholarships were distributed to 137 students (46 boys and 91 girls) on behalf of Shree Kashi Math Samsthan Welfare Fund (SKMSWF) at Karkala Shri Kashi Math where Vasanthotsava of Shree Kashi Math Samsthan is being held this year. SKMSWF was established in the year 1959 by H.H Shrimath Sudhindra Thirtha Swamiji to recognize the meritorious and also to extend a helping hand to students from poor families to pursue higher education.Presently the trust is being guided and led by H.H Shrimath Samyamindra Thirtha Swamij, Mathadhipati of Shree Kashi Math Samsthan.